Following up from their successes of the last few weeks WARTZ forces in Ztumsia, reinforced by a strong column of naval infantry and armour (five tanks and four armoured cars), continued to try and bring the ZITS regular forces to what they hoped would prove a decisive battle. They finally succeeded in pinning the ZITS down in the area of the airstrip at Katanga yesterday and immediately launched an attack without waiting for the helicopters which had proved so successful in their campaign to date. WARTZ forces started their attack by advancing a unit of naval infantry, supported by two tanks, towards the airfield buildings which were held a unit of ZITS militia. High on JuJu berries, the militia launched a human wave assault against naval infantry who had not yet debussed from their trucks. The naval infantry sustained some casualties and lost a truck in the initial rush but after a desperate struggle lasting over an hour they routed the militia. They then continued their advance towards the airfield buildings which had been occupied by another militia unit. The naval infantry stormed into the complex where, deserted by their tank support, they were almost completely surrounded by militia and slaughtered, almost to a man. 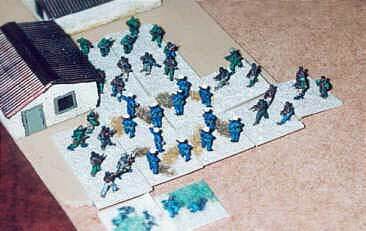 Abandoned by their tanks the WARTZ marine infantry stormed the airport complex but were surrounded by ZITS militia. The reason for the tanks' retreat from the airfield was an audacious flank attack which had been launched by the hugely outnumbered ZITS armour. The WARTZ commander reacted (some might say over reacted) swiftly to this threat by reversing the direction of attack of all his armour, five tanks and four armoured cars, which drove back the attacking armour, brewing up one of the two ZITS tanks in the process. The WARTZ forces failed to make use of their overwhelming armour superiority. 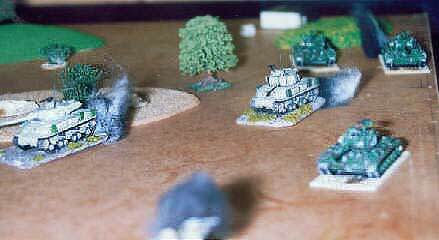 Here they are pictured counterattacking a flanking movement by just two ZITS tanks. After this counterattack the two units of WARTZ marines launched an attack towards a large hill dominating the airfield, supported at a distance by their tanks which took several hours to get back into position. 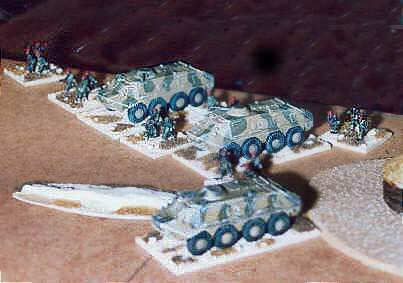 Unfortunately the marines walked into a raging crossfire set up between an infantry unit in Buffel APCs and a newly arrived unit of ZITS technicals mounting AA guns and recoilless rifles, both positioned outside the range of the supporting tanks. The crossfire proved too much for the marines and both units fled the field. 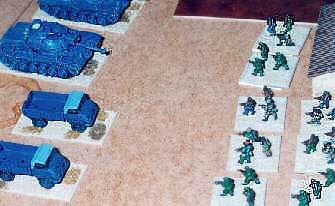 This left the WARTZ forces with only one unit of infantry, Sierra Leonese mercenaries, to support their armour and quite unable to make progress on taking their objectives before nightfall. With all their regular infantry units suffering heavy losses and with the loyalty of the Sierra Leonese in some doubt after this heavy defeat, the WARTZ forces retreated to lick their wounds. Troops from ARSe (the Army of the Republic of Setumsia) have defeated YIDZ (Young International Defenders of Zion) forces after seizing the Radio America transmitting station near the village of Tabernacle in Zion. The ARSe forces crossed the Zion border on Wednesday (July 11th) and ceased the facility which a spokesman for the Setumsian government described as "broadcasting nothing but propaganda, all of it designed to destabilise Setumsia." A strong group of YIDZ forces was quickly assembled for "Operation DJ" an attempt to recapture the radio station and drive ARSe forces out of Zion. 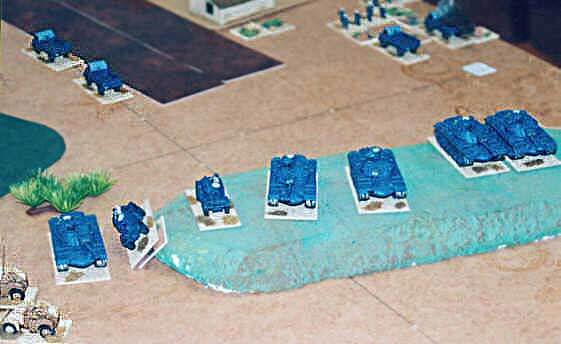 The YIDZ commander made the mistake of launching his tanks through a defile to launch a series of piecemeal attacks. Caught in a vicious crossfire and unable to bring all their guns to bear on the enemy, who were outnumbered three to five, the YIDZ professional tanks managed to kill two of the enemy tanks but lost three of their own and fled in disorder. Two companies of YIDZ infantry, one of them armoured and supported by half-tracks, made some headway towards the radio station, routing the ARSe troops holding the facility. But they routed themselves after being attacked in the flank by the surviving ARSe tank and in the rear by a company of armoured infantry supported by BTR 60 armoured personnel carriers. A unit of ARSe militia arrived on the field and occupied the radio station. The BTRs moved on to destroy a unit of militia and night fell with just a single YIDZ infantry unit in any state to fight.